Okay, you would think I’m sick of strawberries after my weekend experience with them! Let me tell you what happened…. I had full intentions of baking a strawberry cake made with strawberry Jell-O and strawberry frosting for the 4th of July. My plans changed with a good friend of ours brought us an Apple and Pecan Pie instead. This past weekend, my husband’s grandparents celebrated their 60th Anniversary, so I thought I would attempt the strawberry cake again and bring it to the family celebration. Everything started out like it should… the batter tasted awesome, which was a great sign, so I put it in the oven and eagerly anticipated the baked cake. After about 30 minutes, things started to take a turn for the worse. The cake seemed a little too jiggly, so I returned it to the oven for another few minutes. Five minutes later, I pulled the cake from the oven, and it seemed perfect. Looks can be deceiving…. Since I was looking forward to this cake, my eagerness got the best of me, and I flipped the cake out of it’s pan before it was completely cooled… BIG MISTAKE! As soon as I flipped the pan over, the cake seemed to burst in half, and tumbled out of the pan like lava flowing out of a volcano. I was so upset! I then ruined it even more by attempting to make the cake into cake balls. To my unfortunate luck, the balls did not set up… they seemed to turn into even more liquid. 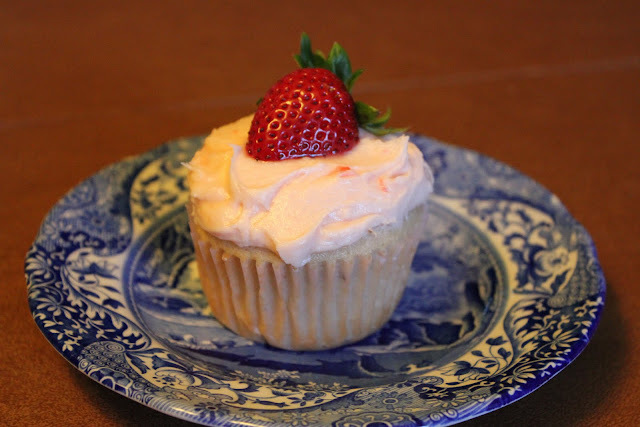 With that said, I don’t know if I will make that strawberry cake ever again….my mom will have to make it for me instead! haha. This afternoon, my husband I started craving something sweet and he suggested I attempt the strawberry cake again…”NO WAY” I thought. 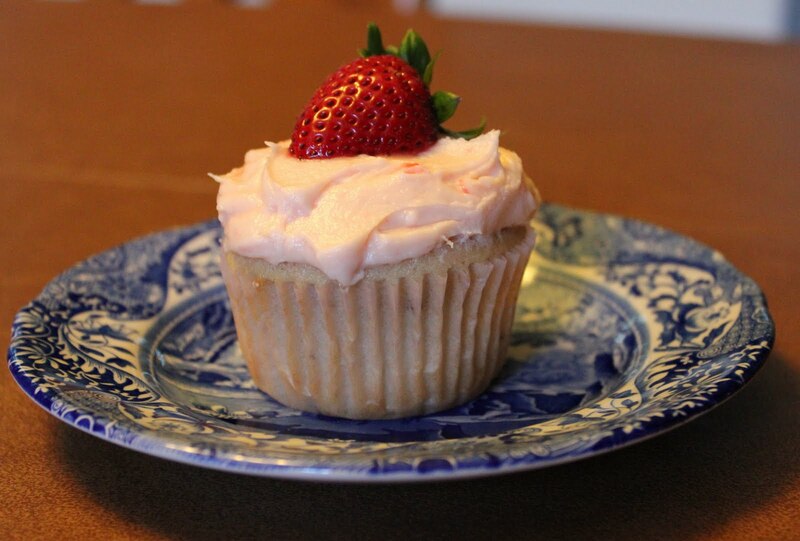 Instead, I had the “brilliant” idea of making strawberry cupcakes. There is no way on earth I could mess those up, especially when they are in the paper liners! I was right, the cupcakes were great and redeemed my self-esteem after the cake fiasco. Has anyone heard of Sprinkles Cupcakes, the world’s first cupcake bakery in Beverly Hills? Most of you would agree with me when I saw they are delicious. They are also one of the largest cupcakes I’ve ever seen. It would be really hard for little ole me to eat a whole Sprinkles Cupcake! We have a Sprinkles here in Dallas, and I know Houston recently opened one too. 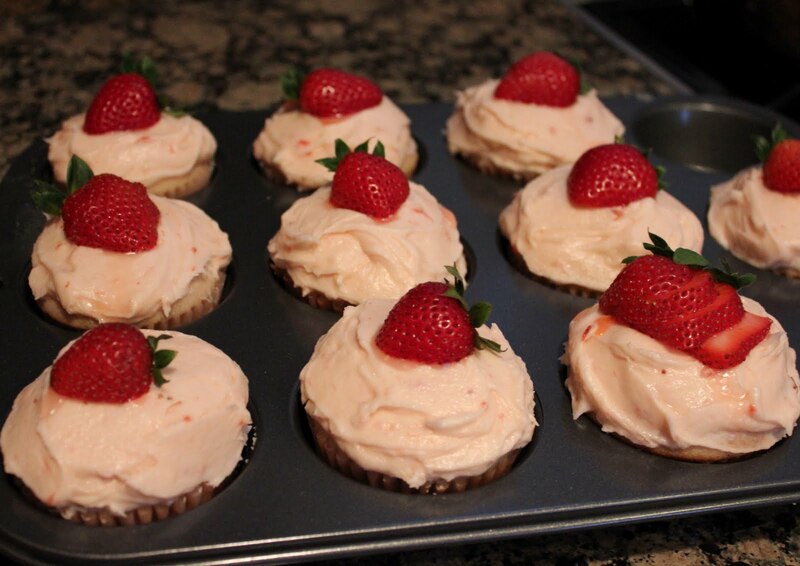 Well, these strawberry cupcakes are “supposedly” the Sprinkles Cupcakes’ Strawberry Cupcake recipe. I thought they were wonderful, moist, and the icing was delectably sweet. No cake mix in these…just pure, fresh, and from-scratch ingredients. No food coloring either….the light pink color comes from the pureed strawberries in both the batter and frosting. 1. Preheat oven to 350 degrees F. Line a 12-cup muffin tin with cupcakes liners; set aside. 2. Place strawberries in a small food processor; process until pureed. You should have about 1/3 cup of puree. Add a few more strawberries if necessary, or save any extra puree for frosting; set aside. 3. In a medium bowl, whisk together flour, baking powder and salt; set aside. In a small bowl, mix together milk, vanilla and strawberry puree; set aside. 4. In the bowl of an electric mixer fitted with the paddle attachment, cream butter on medium-high speed, until light and fluffy. Gradually add sugar and continue to beat until well combined and fluffy. Reduce the mixer speed to medium and slowly add egg and egg whites until just blended. 5. With the mixer on low, slowly add half the flour mixture; mix until just blended. Add the milk mixture; mix until just blended. Slowly add the remaining flour mixture, scraping down the sides of the bowl with a spatula, as necessary, until just blended. 6. Divide batter evenly among prepared muffin cups. Transfer muffin tin to oven and bake until tops are just dry to the touch, 22 to 25 minutes. Transfer muffin tin to a wire rack and let cupcakes cool completely in tin before icing. 1. Place strawberries in the bowl of a small processor; process until pureed. 2. In a bowl of an electric mixer fitted with paddle attachment, beat together butter and salt on medium speed until light and fluffy. Reduce mixer speed and slowly add confectioners’ sugar; beat until well combined. Add vanilla and 3 tablespoons strawberry puree (save any remaining strawberry puree for another use); mix until just blended. 3. Do not overmix, or frosting will incorporate too much air. Frosting consistency should be dense and creamy, like ice cream.